The sixth century BC was not a good time for the people of Israel. Babylon conquered the Hebrew people, and dragged many to exile. Among the first was a young man named Daniel, but God had His hand on Daniel and his friends. They were citizens of God’s Kingdom, but placed in a high position in Babylon. 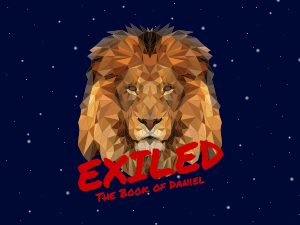 While living in exile, Daniel’s allegiance was to His God and the redeemed people of Israel, but he also served the Babylonian kings faithfully, using his gifts and even prophetic calling to benefit the great city. As our culture is shifting to a post-Christian context, we will more and more discover that we are also exiles, and have to learn how to live faithfully with a foot planted in two kingdoms. The prophet Daniel’s life and stories will give us pathways to remain faithful in the Gospel in the here and now, and his prophetic visions will help us see the sovereignty of God for the future. As a result, we can love our current kingdom and pray for the peace of our city, but our allegiance is to a different Kingdom.